On Monday, you will submit an internal progress report. It’s similar to the kind of progress report that you might give to your manager or co-workers to let them know what’s happening with a project. You also need to know about how to write external progress reports, which will go to clients or stakeholders outside your organization. While the general purpose is the same as that for an internal progress report, the audience is quite different. 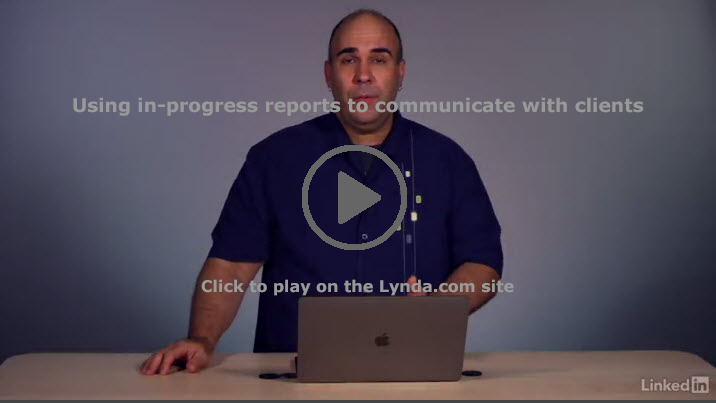 The Lynda.com video Using in-progress reports to communicate with clients (4m 23s) will walk you through the key features and the important characteristics of this kind of progress report. This Lynda video was super helpful at giving me a better idea why progress reports are important and what you should include in them. This video talks about how you want to give your client an update frequently about the project to keep them in the know. However, every time something little goes wrong, you don’t need to call them up/ email them freaking out. Instead of in a progress report saying “oh this project isn’t done yet”, one instead should be more detailed about what is done already and what still has to be worked on. At my internship last summer it seemed like my bosses did send out progress reports frequently, however instead usually they would just call the client up on the phone to let them know what was going on. I felt like this video gave me a better understanding about how to write my progress report about how my genre analysis project is going. I do agree with Danielle’s comment. The video is helpful with explaining the basics of progress reports. I was actually confused with what to include in my progress report until I watched the video. I liked the part where he further explained that you do not always have to report every single mistake being being made on the project. As I watched this video and the video that follows it, I thought about how the content of in-progress reports would be like the content of my research genre, release notes. I think the main similarity between in-progress reports and release notes is that milestones are shared with the client. Most often release notes detail items that are finished, while in-progress reports detail items that are being worked on. However, sometimes release notes will identify known issues to let the client base know that these items are being worked on, but are not yet fixed. That’s a great observation, Katya. I hadn’t considered that connection, but I think you’re right for the most part. The piece that might be left out is details on how you’d fix all the bugs/add the remaining features. This Lynda.com video really sheds some light on why progress reports are important in a workplace. While my discipline does not utilize it as often as others, I see where it could fit into projects. Especially on a product development project or a hired sensory test, giving progress reports ensures your client or boss that recruited you for this work that they didn’t make a mistake choosing you. Communication is always key but especially when money and jobs are on the line. This video gave me a better idea of the considerations of my audience and how to write to them. From this video, I learned about the importance of progress report and how to write good progress reports. Before watching this video, I never thought about report other than the final report or the preview proposal reports. But from this video, I realized how important is to communicate with client and be proactive to be schedule in time. I was neglecting the fact that miscommunication between clients can case the delaying delivery date, running out of budget, and possible unexpected results. I like the part that we are not just telling them what we’re doing, we are also telling them what we need from them. I like the idea of updating the milestone and keeping up with the schedule which I will adapt immediately. After I watched this video, I know the importance of progress reports, and the communication with my client and stakeholder. I had never written progress report before, and I think I just need to email our client what I have done, and what I am still working on it. However, this video told me that progress report can show all of my progress clearly, which can make it easier to be understand by the client. I think the video was interesting because it gave an in-depth understanding of what progress reports are and how they are important for businesses. I agree with Danielle and think that it was a little dramatic to assume that you need to communicate every time something goes wrong. It’s important to fix something and go forward rather than constantly checking with someone if what you did was a little off. Within the first minute of watching this video I began to recall the construction project I was on this past summer during my internship. Our project had two buildings that were being constructed and one that was being renovated. Each month, the superintendent in charge of each building was required to send out internal progress reports that updated our company and the owner of the progress being made. These reports were fairly general and really only included a brief synopsis of the major work that had been completed. After watching this video, I found that there are several items that could be added to strengthen these reports and help those individuals better understand the progress being made. These items include percentages of completion and budget as well as major milestones that had been completed and those that are coming up. Upon graduation, I will be entering the field as an assistant superintendent and could potentially be tasked with writing these reports. Therefore, I found this information to be very helpful to be able to construct informative, well-rounded progress reports that will give a better understanding of the project as they are observing the project from afar.